The Apple S1 is the integrated computer in the Apple Watch, and it is described as a "System in Package" (SiP) by Apple Inc.
From reverse engineering, the processor handling the Wi-Fi and Bluetooth is a Broadcom BCM43342 and the six-axis gyroscope is from STMicroelectronics. 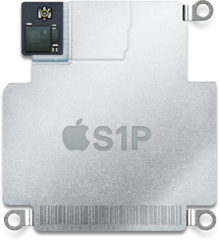 The SiP in Apple Watch Series 1 is called S1P and looks superficially identical to the S1, but it includes most of the new features of the Apple S2 except notably for the on-chip GPS functionality. It contains the same dual-core CPU with the same new GPU capabilities as the S2 making it about 50% faster than the S1. The S1 was announced on 9 September 2014 as part of the "Wish we could say more" event. The S1P was announced on 7 September 2016 as part of the "See you on the 7th" event. The S1 made its first appearance within the Apple Watch, which arrived in April 2015. The S1 was discontinued with the launch of Apple Watch Series 1, containing the S1P. The S1P was released with the Apple Watch Series 1 on 16 September 2016. An illustration of the encapsulated S1 package. The S1P package shows little of the differences that's encapsulated inside. This illustration shows the positions of the chips and other components inside the S1 package. This is how large the S1 is compared to the Apple Watch case. A size comparison of the S1 to the Apple A6 in the iPhone 5. Apple mobile application processors, the range of ARM-based mobile processors designed by Apple for their consumer electronic devices. ^ "s1_decapped_abi.jpg". 2015-04-30. Retrieved 2016-05-01. ^ a b c d e f g Ho, Joshua; Chester, Brandon (July 20, 2015). "The Apple Watch Review: Apple S1 Analysis". AnandTech. Retrieved July 27, 2015. 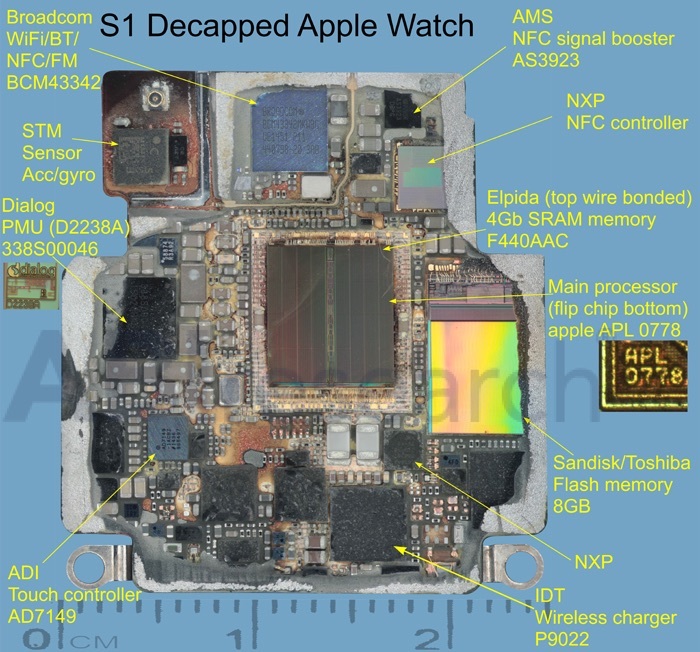 ^ a b "Apple Watch Insides / PCB Details Revealed for the First Time". ABI Research. Retrieved 30 April 2015. ^ a b "Apple Watch runs 'most' of iOS 8.2, may use A5-equivalent processor". AppleInsider. Retrieved 25 April 2015. ^ a b "Apple Unveils Apple Watch". Apple Inc. Retrieved 8 October 2014. ^ a b "Apple.com - Apple Watch - Technology". Apple. Retrieved 8 October 2014. ^ "Broadcom Wins WiFi in Apple Watch?". Chipworks. Retrieved 8 October 2014. ^ a b c d "Introducing the Apple Watch - Movie". Apple. Retrieved 8 October 2014. This page was last edited on 29 December 2018, at 11:25 (UTC).